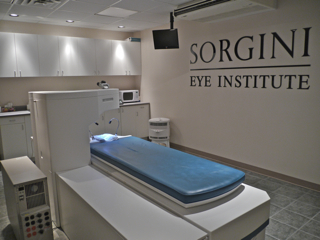 The Sorgini Eye Institute is located in Sudbury and is the only permanent excimer laser clinic in Northern Ontario. It is privately owned by residents of Northern Ontario and is operated solely by the Clinic's Medical Director, Dr. C J Sorgini. Dr. Curtis Sorgini was born and raised in Sudbury, Ontario. He attended the University of Western Ontario at age 17 and was admitted into the faculty of medicine at age 18 with the highest academic standing of all applicants. After graduation in 1984, Dr. Sorgini performed an internship at St. Joseph's Hospital in London. He was then selected as one of two to enter Ophthalmology training in the prestigious program at Queen's University in Kingston. Dr. Sorgini then studied corneal diseases and surgery as part of a subspecialization fellowship in cornea and external diseases at McGill University in Montreal. He then went on to become a Fellow of the Royal College of Surgeons of Canada. Already an accomplished corneal and cataract surgeon, Dr. Sorgini went on to establish the first and only permanent excimer laser clinic in Northern Ontario. With regular conference attendance and participation, Dr.Sorgini closely follows all of the latest advances and implements them as soon as it is apparent that new techniques, equipment or procedures offer even the smallest advantages to his patients. 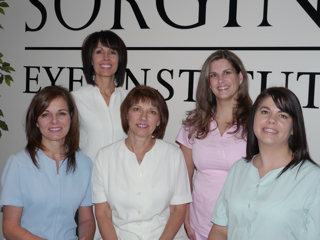 Staff members at The Sorgini Eye Institute are courteous, knowledgeable and are experienced. With over 25 years experience, some of our members have been with Dr. Sorgini since he opened his practice. Our clinic co-ordinator and her administrative assistant will ensure that all the requirements for booking your appointment, any additional needs you may have, as well as all your follow-up appointments are met to your satisfaction. We have 2 laser Technician/Ophthalmic Assistants and our Senior Technician has over 25 years of Operating Theater experience. She has also had refractive laser sugery. As a dynamic team, together we are dedicated to providing you with the highest level of quality patient care. From your initial contact with the office, and throughout your consultation and treatment, you will have a friendly welcoming experience. You will discover our high standards for quality results. The best possible treatment available to you will be discussed. We will assist you in determining whether laser eye surgery will be of benefit to you, will meet your goals, needs and your expectations.